Famous failures – How to equal the greatest – it’s simple! A video and how to succeed ideas. The main reason that we become successful at something is that we work at it. In history there have been many famous failures. They failed at their chosen goal early on. Then they went on to be successful at the very thing they failed at first-off. 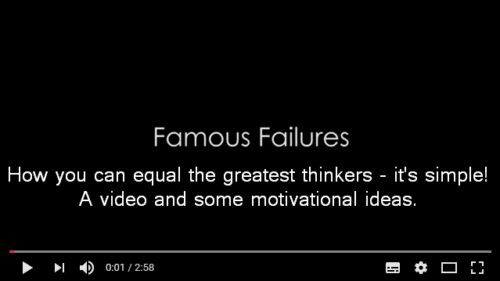 In this video you can see who some of these famous failures are. I think you will be surprised. For us as photographers, we need to think about what these fails mean for us. More after the video (3 mins). We know most of these famous people. We know them, perhaps, as some of the most successful people of all time. So why did they fail? The answer is simple. Everyone needs to start somewhere. We all start from a basic position of no knowledge and no skill. We may have a talent or aptitude. Without development they will never be realised. If we do have them is not the main issue. The point is, these famous people saw that they could get past the failures. They made the effort to go to the next step; then to the next level. Photographers, like everyone else, have to start somewhere. Inevitably starting out is difficult. So, we must expect our own fair share of failed attempts. What takes you past failure? Famous failures usually have two key attributes. First, they pick themselves up, dust themselves off, and start again. Studies of successful people frequently show that they were prepared to fail. Not just once either, but many times. The second key to success is the ability to be persistent. Famous failures will keep on doing, learning, trying, developing, improving and moving forward – regardless of what others say or do. They will, through adversity, keep their eye on the goal and do everything they can to succeed. How do ‘famous failures’ help photographers? Photography, like all pursuits has its difficulties. For us, the famous failures model is important. Many times I have been asked by my students what does it take to be a successful photographer? My answer is, “Don’t be afraid to fail and keep trying”. If you can do that you will learn all the things you need to learn. That is as true for each individual shot as it is for whole shoots and career moves. In this book, best-selling author and world-renowned photographer and teacher Bruce Barnbaum explores draws upon personal experience and observations from more than 40 years of photography and teaching. In addition to photographs, Bruce also uses painting, music, and writing, as well as the sciences and even business, to provide pertinent examples of creative thinking. The examples serve as stepping-stones to help heighten your ability to see and be creative. Ignore failure, and with persistent effort, you will surpass those with talent and creativity who do not apply themselves. And, if you start out without as much talent and creativity as others, you will develop them along the way. This is equally true of the start-up photographer as it is for the keen hobbyist. You set your goals. You go for them. That was really great stuff Damon. The nay sayers will always say “nay”, but one has to keep pushing. You can never satisfy everyone, but you can always find satisfaction in what you do until you excel in it. No one ever said life would be easy, but one can learn from failure. I like that: You can’t fail if you never try. Thanks for the comment. Yes, the nay sayers will always be there. But the way forward is to ignore them and follow your dreams with conviction and persistence.